Home Opinions Attacks on Modi show “How can a lower caste person wear his own branded suit”? Attacks on Modi show “How can a lower caste person wear his own branded suit”? Lower caste people are not supposed to be well dressed? Casteism is deep rooted in the Indian society – an unfortunate fact that no one can deny. This vice is not exclusive to any region or even religion. We have seen people changing religions, but they fail to change their thinking. There are separate graveyards and places of worships for different castes even among Muslims and Christians who have converted from Hinduism. It happens because casteism is a form of feudalism and racism. It doesn’t need any religious scripture’s sanction to flourish in a mind that is affected by it. Thus a change in religion often doesn’t result in the change in the mindset. But it’s not just religions – which are world’s oldest ideologies – but even modern ideologies that have failed to break this mindset. The biggest example is that of communism. Communist parties should ideally believe only in “class” and not caste. They should have been opposing caste based reservations because it clubs people belonging to the proletariat and bourgeoisie classes in a single bucket – that of a caste – and paints them as having common interests and shared identity. This is in direct conflict with the core ideas of communism – where class is the primary identity of a person and the interests of the proletariat often clash with that of the bourgeoisie. However, Indian communist parties realized and conceded that caste was a much stronger factor in the Indian society. In fact, there have been accusations of casteist discrimination even among the cadre of communist parties – proving that even change in ideologies has not resulted in change in the mindset, so far casteism is concerned. This is the reason why the communist parties decided to support the policy of caste based reservations despite it being in conflict with their core beliefs. Many “intellectuals”, who lean towards left in ideology, never fail to bring in any element of casteist mindset while discussing points that range from women’s emancipation to even IT industry. They always argue that casteism is deep rooted in the Indian society, and the subaltern impact it has on Indians and it can’t be ignored. However, they balk at even remote suggestions that their hatred for Narendra Modi could be born out of this mindset. It is part of their hypocrisy that defines them, but I believe that these intellectuals would do themselves a favor by introspecting how much casteist and elitists they are when it comes to Narendra Modi. Their latest disgust for Modi is over the suit that he wore on the Republic Day. It had his name printed on it in form of stripes. One had to zoom in with really strong camera lens to find out that they were not stripes but the Narendra Modi’s name. The fact that one needed to zoom in shows the obsession our left-leaning “intellectual” class has with Modi, but that has been the case for ages now. What they have been betraying thanks to their obsession, is the subaltern casteist and feudal mindset. One of these “intellectuals” who has been most acerbic and unhinged in showcasing his hatred for Modi has been Nikhil Wagle – a Mumbai based journalist who was allegedly fired from the media group Network18 for non-performance. Dear Bhakts,let it be very clear. 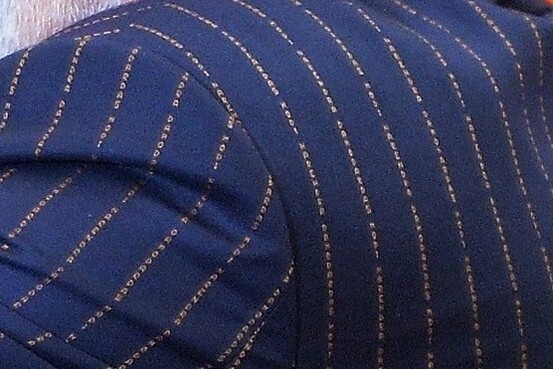 I am ashamed of a PM who prints his name on his dress! It’s a disease according to me. Wagle never declared the members of Nehru-Gandhi family diseased who gave Bharat Ratnas to themselves. Nor did he find it a diseased when hundreds of public properties were named after members of the family. But it is not only about comparison with Nehru-Gandhi family. If that family printed their names everywhere in the country, that doesn’t give license to Narendra Modi to do the same. But did Modi print his name on Ministry of Textiles building? He did it on his private suit. And who knows, he might auction that to earn money and donate it to charity for the girl child, as he has been doing when he was the Chief Minister of Gujarat. There are many crazy Modi bhakts who will pay in millions for this suit, and being a smart trader that he is, Modi could as well use this free international publicity for his suit to auction it. You can’t rule it out. And remember this article (if it gets published) when it happens. Coming back to the hatred for Modi for whatever he does, one can’t rule out the element of casteism and a feudal mindset when they see Modi wearing a suit that has personal branding. How is it different from having an iPhone with own name inscribed on it? Many do that! But that is something only high class and high caste people should do. The lower castes, the chaiwala, is not expected to flaunt any any such personalization. He is not supposed to make any fashion statement, because look, he is an uncouth unshaven heathen who can’t speak English the way we do. No matter who much they deny it, the feudalistic and casteist mentality is one of the various factors what is making them hate Modi. I don’t want to point it out, but just look at the castes of those who are most acerbic – from Congress supporting journalist Mihir Sharma* and likes of Nikhil Wagle, from AAP supporting comedians Rohan Joshi to Tanmay Bhatt, to writers like Pankaj Mishra and Girish Karnad, to celebrities like Mahesh Bhatt and Vishal Bhardwaj – almost everyone is a Brahmin, and thus suffering from a risk of nursing a Brahaminical mindset. I want to make it clear that I don’t believe in linking someone’s caste to their ideology, but I am forced to do the same as the “left liberal” commentators invariably do the same when it suits them. I am using the same arguments that they use, and thus they should be fine with it. I am not fine with it, even though it suits me on this occasion. The current generation may not remember, but even BR Ambedkar was ridiculed when he wrote that “English suit”. People claimed it was not “Indian” thing to do when other revolutionaries like Mahatma Gandhi were shedding clothes and those like Jawaharlal Nehru were wearing khaadi. But today we know how big a symbolism was that suit. The same mentality is responsible for ridiculing Modi for wearing a designer suit. What is needed is that this bunch introspects if they would have done the same if Narendra Modi was an upper caste accented English speaking Indian? Wouldn’t they have been celebrating a “Modi suit” like they celebrate a “Nehru jacket” and “Rajiv Gandhi shawl”? I know they won’t introspect, and will continue to betray their feudal and casteist hatred against Modi continuously and prove us right. They are welcome. They will only prove my theory. *update (12th June 2015): the writer of this article had assumed that journalist Mihir Sharma was a Brahmin Hindu, but a latest video reveals that Mihir Sharma was raised a Christian. The editorial team at OpIndia.com has thus struck off the name from the article.